Anytime Locksmiths 24 hour service is available for all emergency lock and key problems you may encounter. Locked out your flat? Lost the key to your office? Key stuck in the ignition after a midnight party? 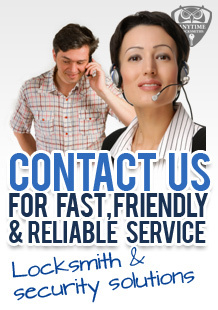 Professional local locksmith 24 hour emergency service ensures you won't be stuck for long. Break-ins and burglaries can cause much headache and stress. Anytime Locksmiths do the utmost to minimise the stress by providing a rapid response service with a call out of usually 20 minutes or less, to lock pick open, fix or change locks and keys and help with broken windows and doors. Our security experts can also recommend ways to strengthen your home or office security to prevent further break-ins. From strengthening or adding locks, recommending what and where extra lighting can be most effective, our technicians can offer inexpensive home security solutions. Various entry access systems and alarms are available for different needs and Anytime Locksmiths offer free security advice with every callout. In addition to our home locked out service, we offer an auto locked out service in case you get locked out your car. We provide roadside assistance meaning we will come to you whenever and wherever you are. As desperate as you are to get your lock open, you will want to minimise or prevent damage wherever possible. Our team of trained and experienced locksmiths use non destructive entry methods wherever possible so you do not have further costs and aggravation fixing broken doors or windows. Locksmiths are not just for emergencies. Local locksmiths are available for installing locks, lock change, home security and office security advice and entry access or alarms fixing as well as many other lock and key services. Our customer service is our top priority. Our satisfied loyal customers come back to us time and time again as a result of the top service provided. If you are looking for a credible, trustworthy and cost effective locksmith available 24 hour a day don't hesitate to call 0330 088 2969 for Anytime Locksmiths.